Phamaly Theatre Company and Craig Hospital have created a partnership to engage Craig graduates and patients, as well as the community, in thinking about diversity, inclusion, and disability through the lens of professional theatre. Englewood, Colo. – (Aug. 4, 2017) – Phamaly Theatre Company and Craig Hospital have created a partnership to engage Craig graduates and patients, as well as the community, in thinking about diversity, inclusion, and disability through the lens of professional theatre. As part of the partnership, Craig was the premier sponsor for A Midsummer Night’s Dream, which ran in May, and is now the premier sponsor for ANNIE, which is running July 15 – August 6 at the Stage Theatre at the Denver Performing Arts Complex. Comprised entirely of performers with disabilities, Phamaly is known for reinventing classic stories and creating moving experiences. Craig graduate Stewart Tucker Lundy is playing the roll of Franklin Delano Roosevelt in ANNIE and another Craig graduate, Regan Linton, who is the first artistic director in a wheelchair of a major theatre company, is directing the show. “I value every moment, whether it is on stage or directing, and treat each theatrical endeavor as a unique opportunity to connect with others. I believe acting is the ultimate exercise in empathy,” Linton said. “ANNIE is more timely than ever, showing courage in the face of uncertainty. With beloved classics like ‘Little Girls,’ ‘Hard Knock Life,’ and the anthem, ‘Tomorrow,’ ANNIE reminds us that by coming together, we can make it through the toughest of times,” said Linton. Additionally, Craig will support the 2017 – 2018 VOX program, which gives a voice to the experiences and perspectives of people with disabilities. VOX, which is Latin for “voice,” is made up of different pieces of theatre that are written by individuals with disabilities. In the past it has been a stage production but this year with Craig’s support it will be a blend of stage and live theatre paired with video. VOX will premiere on stage in October 2017 with the videos available on the Phamaly website early 2018. 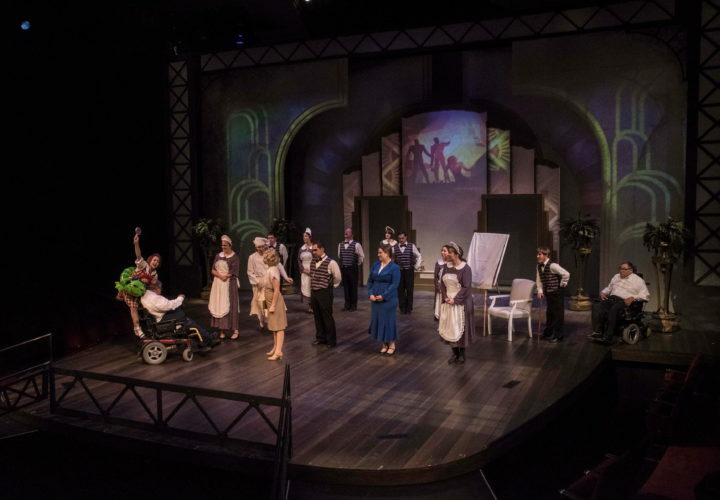 Now in its 29th season, Phamaly Theatre Company is an award-winning Colorado-based theatre company that engages audiences in thinking about diversity, inclusion, and disability through the lens of theatre. Comprised entirely of performers with disabilities, Phamaly is known for their groundbreaking reinvention of conventional stories, creating what has become some of the most entertaining and moving experiences available to Denver audiences. Phamaly’s mission is to inspire people to re-envision disability through professional theatre. For more information, visit Phamaly.org. Craig Hospital is a world-renowned, 93-bed, private, not-for-profit rehabilitation hospital and research center that specializes in the care of people who have sustained a spinal cord and/or a brain injury. Craig provides a comprehensive system of inpatient and outpatient medical care, rehabilitation, neurosurgical rehabilitative care, and long-term follow-up services. Half of Craig's patients come from outside of Colorado. Craig has been ranked as a top 10 rehabilitation center by U.S. News and World Report for 27 consecutive years. Craig has received the NDNQI® award in 2009, 2012, 2013, 2014 and 2015 for the highest quality outcomes in nursing care in a rehabilitation facility. Craig was voted by employees as a "Top Work Place" by The Denver Post for the past three years, and was ranked in the top 150 places to work in healthcare by Becker's Healthcare in 2014. For more information, visit craighospital.org.